WHERE is Doctor Who? Stranded in the Tardis, somewhere In space? Or gathering dust in cans on ABC shelves? The ABC has just announced that the 28 new 'Doctor Who' programmes which were shown in England last winter will not be seen on Channel 2 until next year. Local fans with serious cases of 'Doctor Who' fever had been expecting the new series in May this year. Instead they got 'Monkey' for 26 episodes and after that, who knows? No one, except that it will not be 'Doctor Who'. An ABC spokesman told the C Page this week the decision had been made because of a number of complaints about repeats of 'Doctor Who' episodes. Viewers wailing with the agony of the news are asking: "Why worry about repeating programmes which have not yet been played." Viewers also constantly ask: "Why not show one episode of 'Doctor Who' a week, the way they do in England, so the series wouldn't be gobbled up so quickly?" We would like to hear your views. Write to the C Page and let us know whether you think the ABC should screen the new 'Doctor Who' series this year or save it up until 1982. Address your letter to 'Doctor Who', c/o Green Guide C Page, 250 Spencer Street, Melbourne, 3000. I AM a great fan of 'Doctor Who' and I would like to know when the ABC will be putting the serial back on. I know there is a whole series to be shown. JUSTIN HANAN, 12, Chanel College, Geelong. SINCE Patrick Burke wrote about the new 'Doctor Who' series, I have some more recent information. The new series consists of seven four-part episodes, as follows: 'The Leisure Hive', 'Meglos', 'Full Circle', 'State of Decay', 'Warrior's Gate', 'The Keeper of Traken' and 'Logopolls'. The doctor gets a new companion, Ardic, in the story 'Full Circle'. Ardic is an "Outer" and has the Star of Math-matical Excellence. In addition, Romana (Lalla Ward) will leave in 'Warrior's Gate'. Tom Baker will be leaving the series to be replaced as the doctor by Peter Davidson. I am a 'Doctor Who' fan and have books, articles, pictures, poslers,. etc. Also, I am a meMber of the. 'Doctor Who' Appreciation Society in England. I WOULD like to inform Adam Read and Lisa Beaumont that here is another 'Doctor Who' freak. This 17-year-old programme is the longest running sci-fi serial on earth. Thousands upon thousands of 'Who' fanatics litter Australia. If you are fanatical enough, the postal address for the 'Dr Who' Club of Victoria is: PO Box 4, Degraves Street, Melbourne, 3000. As for that unenlightened individual who mentions something about "monotonous 'Dr Who' repeats", "this year the ABC, I hope, will probably show a new season followed by a few decade-old repeats that have been forgotten. WHY doesn't the ABC Show some of the earlier 'Doctor Who' shows? There has not been a 'Doctor Who' with Patrick Troughton, much less William Hartnell(the first and second doctors) for at least two or three years. THERE'S a K9 loose in Canterbury. It has a head that moves, an eye that pops in and out of its forehead and a light that comes on when it's figuring computtions. It was made by 11-year-old Michael Kitson, who has been a 'Doctor Who' fan since he was four years old. The room Michael shares with his nine-year-old brother Max is packed with 'Doctor Who' posters, models of the Daleks, 'Doctor Who' novels, magazine and newspaper cuttings (many from the Green Guide) and a large, wooden K9. Max has learned to defend his territory in the room by setting up his cupboard as a barricade. It keeps the 'Doctor Who' material from flooding everywhere. When. things get bad and the Dalai; are on the, march he gees downstairs and plays with his trains. Max says 'Doctor Who' is good, but Michael thinks It's great. He says some people eventually grow out of 'Doctor Who' fever, but he'll be a fan forever. 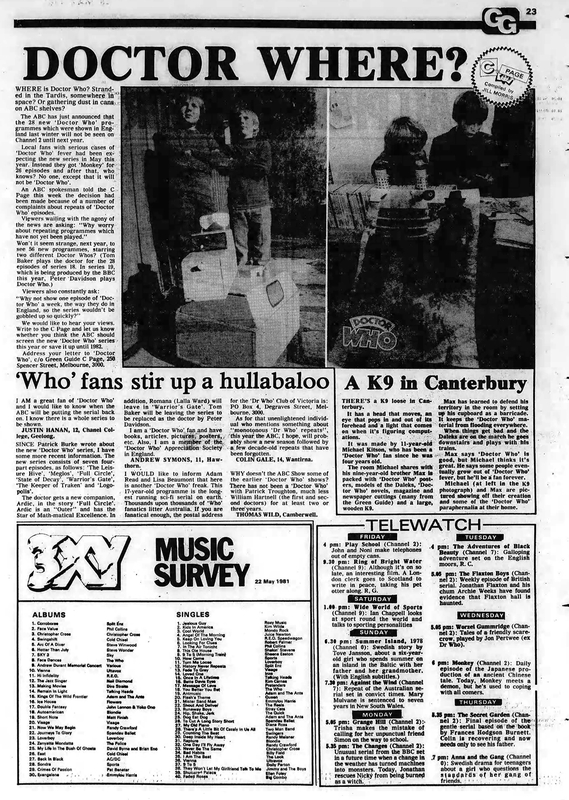 Michael (at left in the K9 photograph) and Max are pictured showing off their creation and some of the 'Doctor Who' paraphernalia at their home. APA 6th ed. : (1984-05-21). Doctor Where? (The Age). The Age p. C Page, p. 23. MLA 7th ed. : "Doctor Where? (The Age)." The Age [add city] 1984-05-21, C Page, p. 23. Print. Turabian: "Doctor Where? (The Age)." The Age, 1984-05-21, section, C Page, p. 23 edition. This page was last modified on 3 April 2019, at 00:07.